G-Connector now features support for complete offline data pulls and pushes to/from any tab in your spreadsheet. Automatic data pulls are an amazing way for you to not have to buy Salesforce licenses for those users who only need read-only access to the system. Now you can pull data from Salesforce.com into a Google Spreadsheet, share that spreadsheet with anyone using Google Drive, and schedule automatic offline refreshes as frequently as once an hour. Users you share your spreadsheet with don’t need access to G-Connector to see the data. 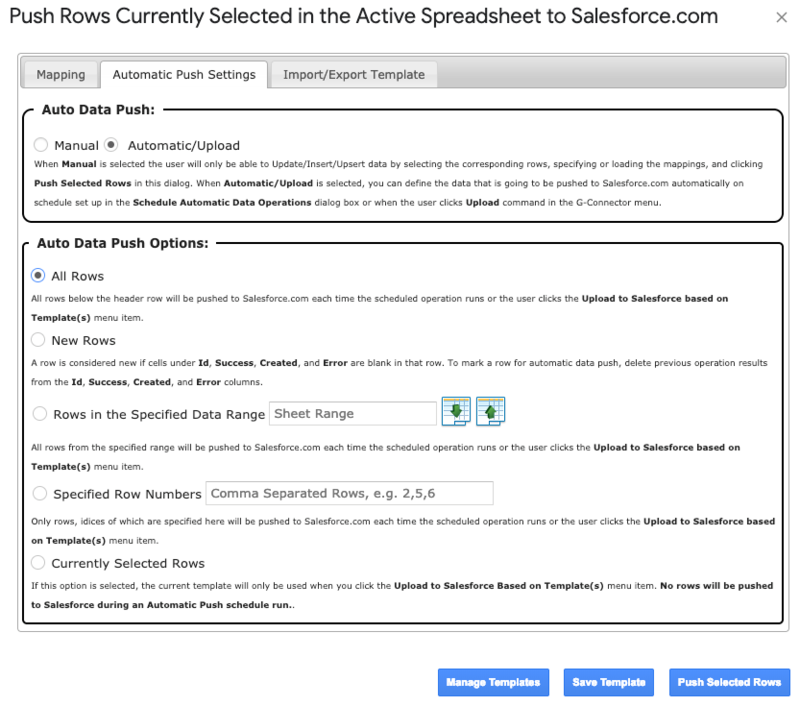 Automatic data pull will only work on the original worksheet that you pulled the Salesforce.com data into. If you create a copy of your worksheet – you will not be able to refresh both from the UI and from the refresh scheduler. 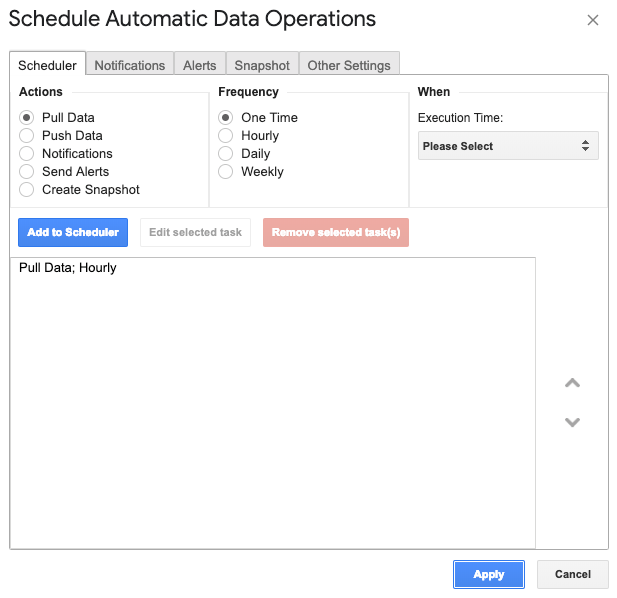 Automatic data operations will always run as the user who scheduled it. If you share a document and another user with access to G-Connector re-schedules the auto-refresh, the data will be refreshed using the new schedule and as the user who last scheduled it. You can make it possible for the users to enter their data in the spreadsheet, and it will push it back to Salesforce on a schedule and using the settings you specify. The set of settings that are used to push data to Salesforce are called Templates and can be accessed by clicking the Template Manager item on the G-Connector menu. You can change the order of execution of a template by selecting it and pushing the Up or Down button on the right. Each template represents the collection of settings set up in the Update/Insert/Upsert dialog box. The Mapping tab in that dialog box lets you map your columns to fields in Salesforce, specify the starting cell of the data range to be pushed to Salesforce, specify the mappings name, batch size, and whether empty values should overwrite existing values in Salesforce. The Automatic Push Settings tab in this dialog box lets you set up the automatic push behavior for each template. Setting it to Manual means that this particular template will not be considered when doing an automatic push operation on schedule, as well as when the user clicks the Upload button on the menu. Automatic setting will enable the template for automatic scheduled upload or for the Upload to Salesforce Based on Template(s) menu item. Why do I need to provide my permission to send email on my behalf? How do I transfer my G-Connector license to a different user?